Warm colour, coarse texture and its straight grain makes Red Oak one of the most popular hardwood species, with a versatile and varied use and appearance. Red Oak, also known as American Red Oak or Northern Red Oak, grows on the Eastern of North America. Its medium wieght and coarse texture came from logs which primarily are founded throughout the Appalachians, Ohio and Kentucky. 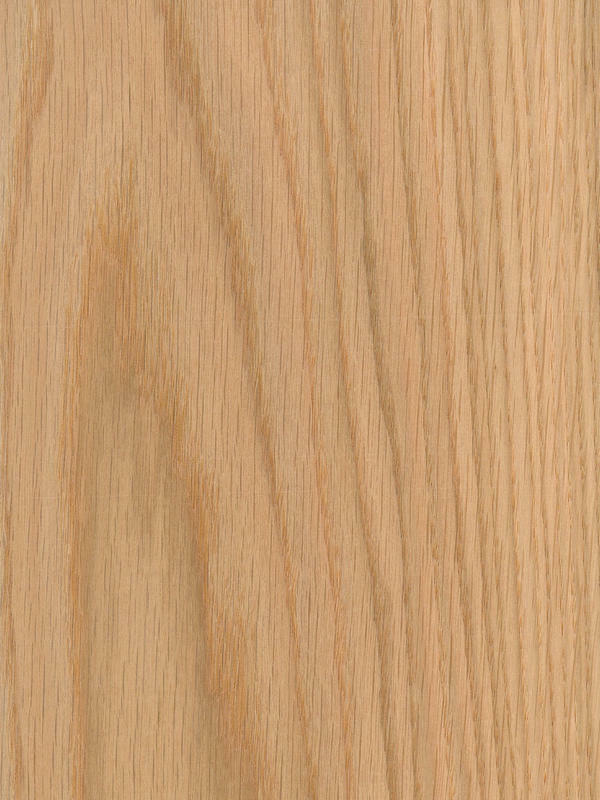 A faster growing member of the Quercus family American Red Oak veneer has a coarser, more open grained texture surface. Its fibre is also straight. As its name implies a slight reddish hue is visible in its appearance. Indeed, the colour of the sapwood varies from light grey to pale red, and the heartwood from pinkish to pale red or clear brown. The heartwood is similar to the of other Oaks, with a toasted or pink color, but has a reddish tint. Red Oak Crown Cut often has a good structure, producing a nice cathedral crown and its grain has a nice pattern. Growth rings are visible. Wood rays are also visible and present the classical flakes of oak in the radial section, but less pronounced than White Oak. Infinite combinations born from Red Oak. This veneer is nearly to all common uses of hardwoods, and especially popular where strength and durability are required. Moreover, many sizes are available and are great for any project. Many logs of this species are peeled in the U.S.A. for commercial plywood manufacture with only the better logs being sliced for decorative veneer. Red Oak Crown Cut is widely used in furniture, doors, plywood, paneling, moldings, woodwork, cabinets, and tables. Some figured or exceptional logs are used architecturally for oak panels, doors, and accents. That is why Red Oak Crown Cut can gives infinite possibilities to suit at any space. It can creates a warm and classic atmosphere or even being combinated to show a modern and minimalist scene without leaving its natural appearance.